Growing up in Small Town America in the home that my ancestors built instilled an appreciation of my American roots and love of Country. The blood of Roger Williams, defender of religious freedom and founder of Rhode Island, Jonathan Alder, pioneer captured and raised by the Shawnee Indians, Stephen Foster, the father of American music and William Travis, commander of the Alamo run through my veins. I grew up in this land of opportunity, America. I married, raised a family and prospered. I achieved the American Dream. That dream is no longer as possible for my grandchildren. Our country is morally and economically in decline. My retirement investments have lost half their value. My husband, born in India and I have decided to outsource our retirement to India. As my husband puts it, we are going home. 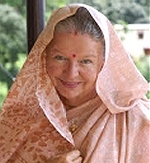 Check out my White Indian Grandmother website. You can also reach me by email. As I have said, India is not for the faint of heart. Basically, things don’t work well here. Electricity comes and goes, sometimes for days at a time. Many of our friends and family have backup power generators. Homes are not constructed with insulation. There is no central heat and air. The outside air temperature of 50 degrees F can make for a very cold house and a very hot house when it gets to 115 degrees F in many parts of India. I cannot imagine what winter would be like. This winter we went back to the States. India’s infrastructure is poor and getting worse. The roads are crowded and in need of repair. Repairs that are made do not last more than a year due to substandard materials. Delhi is two hundred miles from Ghorakhal. It takes a bone jarring eight hours by car. Our flight from the States was delayed due to weather. The delay caused us to miss our train and we could not get tickets on short notice. Traffic especially in the cities is very heavy and traffic laws are not obeyed. The biggest vehicle takes the right of way. Pedestrians, goats, horses and oxen pulling carts are allowed on the toll roads. The railways and trains are owned by the government and have not been upgraded in years. One must book a ticket thirty days in advance and then be put on a waiting list. Only 47% of Indian households have toilets, 3% use public facilities while the rest relieve themselves out in the open. Garbage management is almost nonexistent, even in the big cities. Garbage is thrown in any empty space that can be found or out the front door into the street. The lack of bathrooms and untreated garbage has contaminated most of India’s ground water and rivers. Only 33% of households have access to treated water. Those households with means have a water filter. Much of the construction is done by unskilled hand labor. There seems to be no uniform building or electrical codes. Bribes are expected and required to get anything done. Cooking gas is government subsidized. Since we are not Indian citizens we cannot legally buy it, forcing us to get it from the black market. India is not a pet friendly country. Though it was expensive we were able to bring our two elderly dogs. Both have since passed away. This year due to a change in the law only those planning to permanently relocate here are able to bring in their dog or cat. The loss of our pets left a huge hole in our hearts. While we were in the States and after we obtained our new family members, two Toy Fox Terriers we found out about the change in pet regulations. Tourists will not be allowed to bring in their pets period. The cost of relocating our pets including air fare, pet passports and bribes ran us $2700.00. Our pets were held for 16 hours by Delhi’s cargo hold and not released to us until we paid the bribe. Fortunately we were allowed to feed and water them while they were being held. Including the flight time they spent 30 hours in their crates. We were fearful that they would be stolen as I have not been able to find the breed here. My husband and I have decided that if we do leave India with our dogs we will not return. The negatives of India have caused us to rethink our retirement here. We plan to extend our stay here for the next twenty months. At that point one or both of us and our pet children will fly back to the states to see family and take care of business. I do love where we are living now and our simple peaceful lifestyle. There are many parts of India we want to see and experience. We have made some very good and dear friends here. We are not sure if we want to put up with the lack of infrastructure, the difficulty with traveling from place to place and India’s growing population and bribe expectations. Time will tell. Click for additional posts about India. Can you share more details how did your husband recovered from insulin ? I am thinking of retiring in Uttarakhand. please suggest some place and the price of some decent accomodation which i can purchase. i am from bombay. Ghorakhal, Uttarkhand, is a beautiful place. I have not been there but I have seen pictures of it. But what would bother me, if my wife and I were to live there , is its distance from Bangalore, our home town. That apart, thank you for this excellent article; everything you have written here (friendly, beautiful people, corrupt government, the dirt and filth, lack of sanitation and clean water for most Indians) are all, unfortunately, true. It has been more than one and a half years since this was posted. It will be nice to have a follow up. I just realized you have moved back. Are you settled now or you wish you had sweated it out? I live in united states (citizen) here from the last 16 years. I am 42 years old. Recently I visited India for 4 months ( including Mathura/varindavan/Rishikesh) and realized India could be permanent retirement place But I really liked more Rishikesh than Varindavan. In Rishikesh, I stayed for 1 month. Weather is good even in summer as well as pollution level is very low, right in mountains. People are much nicer and honest. I am planning to buy one home in Rishikesh now. I feel Rishikesh could be permanent place for me for my rest of my life. There are lot of Ashrams in Rishikesh area and of course GANGA. I have been to Badrinath temple 14 times. I feel there are lot of places in Mountains to explore once I settle in Rishikesh. I am (44) also thinking/planning to move to India and focus more on spiritual/quality life. Vrindavan would be perfect for me as i am Hare Krishna devotee but i am also looking at Mayapur in West Bengal and other places. I don’t think buying condo is the best idea at this moment. Rent is cheap and gives me a lot of flexibility to move around. Biggest problem is long term Visa as i am not of Indian origins. 1. Rent , don’t buy. As a rule of thumb, indian prices are 25% of New York/ Sydney / Dubai. Ignore the big cities, head to the tier 2/3 towns. Keep an eye on pollution levels and water availability. 2. Go vegetarian and cook your meals. Invest in a rice cooker. Rice and lentils are staples here, if you adopt this diet, your dollar will go the extra mile. 3. Research and invest in the local stock market. If you can’t be bothered, pick 3 mutual funds and put a small percentage of your savings. Hold it for more than a year and your gains are tax free. When you retire in India and you are a US Citizen , what are the tax rules? Tax has to be filed in both India and USA. What are Investment Options. If anybody has any experience , please share. I am Indian-born entrepreneur in Canada and planning to set up a retirement home in the foothills of Himalayas. The average monthly disposable salary after taxes in India comes to about 31,158.73 INR (approximately $472). Although prices vary throughout the country, such low average costs obviously mean the average American has plenty of options when it comes to retiring in India. In fact, a monthly disposable income of twice the Indian average – about $1,000 – can translate into a very comfortable standard of living. I am retired female, now living in Florida USA and seek to relocate to Ghorakdal or near Spiritual Science Center. I am sattva student and would like to hear from another who seeks to retire in Ghorakhal or near Spiritual Science Center. Any one interested in joining me….? I am an American Born, USA citizen who has been living in Andhra Pradesh along with my Andhra Born Physician Husband for the last seventeen years. Before settling in India we lived in USA after marriage for almost twenty years. Lately I am missing living in America very much. I am also a Grandma. One daughter is in Pune and the other in USA. As we get older it gets difficult to manage here in India. House keepers are very unreliable and it is impossible to look after a large house without help due to so much dust and pollution and lack of workers to reliably maintain the grounds. If you are planning to settle for retirement in India from USA I would strongly reccommend that you think a thousand times. One or two year visit yes, but permanent settlement is very very difficult and requires that you become a really dettached Yogi. Are you still happy there? I am a 64 yr old who wants to get out of the rat race but scared to make the leap…fear of the unknown. $1000. a month for all my expenses would be wonderful. How do you travel from your city and do you have internet???? phone??? Yes, I too have a plan to settle down in Uttarakhand. I’m now 64, living in Arizona, and starting to collect my social security. I’ve been a practitioner of meditation since the age of 14, and seriously considering relocating to Rishikesh. I’m wondering that since it’s quite a tourist destination, is the cost of living higher? What is the cost of medical care? and can a little private dwelling be found for say the equivelent of $150.00 a month? I am interested in joining you. I have a dog, how do you feel about a dog? Have you built a home on the land or is it vacant? I am retired and planning on transitioning to move to India in 2017. I currently live in NYC. Where your land is located how far are you from the nearest city or town? What is around the area? Is the drinking water clean? I devote some of my time with practicing Paramahamsa Nithyananda Integrity techniques and other techniques and also practice Anandmurti Gurumaa Nidra Yoga.I want to learn higher practices. I also enjoy gardening and singing bhajans. Hope to hear from you. I am a retired Indian Professional living in Orlando, Florida. I lost my wife 2 years back due to cancer and living alone. Planning to move to India. I am 74 years old and from Karnataka and US Citizen. What are the income tax liability, US SSA requirement, Travel issues and suggestion will be greatly appreciated. Are you seriously looking to create a deliberate community? I live on my British pension plus a little extra that I earn from typing/copy editing/proofreading. If anyone has any advice or comments for me I would like to hear. Hello Linda , , Im Canadian , caucasian and also looking at retiring in India . Im struggling with visa information . If you or anyone has any information , suggestions I would really appreciate the help . Thinking of an all encompassing hotel in india then i will make a choice. Do you know of a good one? Hi All, I am also very interested in retiring to an all encompassing hotel in India but so far have drawn a blank. Appreciate your comments/advice. I am US citizen of Indian origin 64 years old.Almost ready to retire. Before moving to USA 20 years back I traveled a lot in India due to my work. I was also fortunate to visit a lot of other countries. I live in Washington state and lived before in New Jersey and Nebraska. I did a lot of research and spoke to a lot of friends in India. Get overseas citizen of India card. It is like double citizenship. 2.For Americans-get 10 years visa. Can stay 6 months in India. In India a 1 bedroom furnished apartment rent is 15000 to 25000 Rupees. It comes to 250 to 350 USD per month. Please use magicbricks.com and 99acres.com to find one. Grocery for 2 people is USD 200 or less/month. Help part time is 100 or less/month. Total for 2 people comes to 1000 or less. In hills like Rishikesh-Haridwar there are a lot of opportunities to do yoga,meditation ,social work and trekking. I know a guy who is is associated with NGO. I am planning to rent out my home in Tacoma WA for one year. I hope info is useful. Retired people from western countries live a better and cheaper life . Hats off to all who have retired in India. I was born and brought up in India – now living overseas for the major part of my life. I left India when I was 19 and am now 52 years old. Although I have visited India in the past and even got married there, I’ve not returned to India for the past 15 years. And although it is my birth place, of which I have many fond memories – most of them are now faded with passage of time, development, the rise of the population and accompanying pollution – together have taken a toll on the beautiful clean life I once experienced as a child and growing up lad. I will urge all, specially to the Non-Indians, to pay special attention to the advise given by Radha Gunta, and to again read between-the-lines the entire experience as stated by the original poster of her experiences in India. The benefits of low cost of living, and nice friendly people are soon over-shadowed by the reality of the filth, low hygiene levels due to poor sanitation and etiquette standards and zero manners practiced by the uneducated class (population) due to lack of education. Even basic necessities become a prestige to have – not to mention the petty bribes at every step of the way in your daily living. India is no walk in the park folks! Yes, local people treat you with respect, and love you for who you are, but coming from my experience, the basic necessities, an educated gentry of certain IQ level and exposure, and daily hygiene practices are more important to living a stress free life, than looking for a low cost of living country. Even spiritual programmes become useless and meaningless when basic standards of living begin to feel like a distant memory. In my opinion, and specially for people who are not of Indian origin, there are other better places which are less corrupt, and where one has access to basic necessities at least. Caucasians, beware! India will not live up to your dreams of blissful retirement. I highly doubt that bliss still exists in India! To all other caucasians – visit several times before deciding to set up life in India…there is no substitute to personal experience…India is good, but it may not be the life you imagined. Me, being an Indian, am not retiring in India…sorry folks…really very sorry! I love India minus its drawbacks. Brahmann .. thanks for your comments. It is easy to romanticise India with such western movies and Exotic Marigold Hotel and Good Karma Hospital etc I visited, and stayed for a year more than 20 yrs ago. I loved it. But I was young. I’d love to retire in Rishikesh, my guru visits there each year, I could take up yoga, and live a “spiritual” and relaxed lifestyle, healthy vegetarian food – but the reality is quite different from the dream I can see from the many comments. Things seem to have changed a little, but the hygiene and lack of infrastructure/water/electricity etc does have an impact. I will visit in 2018 for a month. Perhaps stay 2 to test it our again with a view to staying for 6 months of each year, and returning to Australia for 6. I’m not sure if this will be financially viable, if I can rent in each place when I leave … any ideas? Even from my own personal experience, India has changed dramatically over the last 5-10 years and especially with the new govt and advent of technology, a lot of the daily minor irritants and inconveniences are rapidly and permanently ending. Thus it is possible to achieve the same and higher quality of everyday living at par with western societies-such that even Diaspora members of my own family are now moving back to India in their fifties and later. 1) The strong sense of serendipity and adventure – life tends to get bland and predictable after a while elsewhere. There is never a dull moment in India. 3) Brighter colors, warmer weather, lots of people and animals/wildlife – less depressing. I live on the outskirts of Delhi- supposed to be one of the worst places to live in- and yet we have over 50 species of birds, and other animals co-existing, along with plenty of tropical vegetation that does make one feel more happy and tuned to the wonderful planet in a much better manner. 4) Possibilities for cheaper assisted living- cooks/housekeepers/attendants/daily masseuses/cleaners/chauffers/utility fixers/maids, nurses- there is help for every budget and every need available. Yes its a bit hard to find and retain quality, verified help. For the negatives, yes Indian public systems are creaking at the seams due to the sheer growth in numbers. But please remember we also have the largest number – 800+ million, of workforce available and hungry to help out. Also, Indian systems are designed for being labor intensive and dependent on other people- such as family, neighbors and communities, as well as outside help, hence its a bit difficult for folks who are used to independent, rugged, isolationist, self-help living. On the plus side, if you have the right help/butler/concierge services, life is an absolute luxury over here. And general human interaction as we grow older is anyway better for our emotional and physical well-being. Just like in the US- apart from there now being a (US Clone) “app for everything”, our replacement for apps is people. So instead of self-driving cars, we have autonomous driving in terms of hiring chauffeurs. Each day in India is anyday better than living in expensive nursing homes, assisted living and retirement communities of the West. You will save a lot more money, and have a much better and happier life. Not to mention having a lower lifetime carbon footprint. India is still new to the concept of recreational pet parenting- though it is exploding at a viral exponential pace as more Indians become affluent and adopt Western customs, so all your needs are now met in most superstores, vets and breeding areas. However, India has a strong tradition of community pets, and keeping bovine and farm animals, birds and pigeons as pets over dogs, rodents, reptiles. 3. Volunteering and teaching underprivileged kids, providing after school support and nutrition to the kids to ensure generational upward mobility. 4. Travelling both within India and abroad once every couple of months. Flight connectivity has improved dramatically and so have roadways and general tourism infrastructure everywhere in last 3 years. You have billion dollar unicorn startups like Oyo Rooms, MakemyTrip, and Yatra making this happen now. 6. Active writing and media- they write articles for local media, deliver talks on radio, even wrote cookbooks and presented cookery shows, and write out memoirs. 7. Investments- we now manage and do stock market investments both in the India and US, and its surprisingly easy to manage from home, My grandmom learnt investing in her 70s, and is making a dollar denominated 10% IRR return for the last 10 years. 9. Learning new skills- they are now learning cooking various world cuisines, and painting via a variety of media. 10. Are also learning more about Indic religions, philosophy and reading up on various primary texts, by learning more of Sanskrit. Several of these texts were inaccesible to them when they were young and poor 70 years ago. Only now in the 2010′s onwards. are translations more easily available and there is more systemic attention paid. 11. Farming and gardening- they love doing this! Grow all flowers, fruits and vegetables on rooftops , terraces and gardens, as well as our community garden. This is so relaxing for them and they get pride and joy in watching things grow. Hello everyone! I’m 64 years old, from San Francisco, CA, retired, and occasionally do volunteer work overseas for six months to one year at a time. Now I want to do something for myself, and that is to go on a six months to one year vacation. I’m planning to live in a city or province in India with the purpose of simply engaging in a new culture, make new friends, and perhaps learn a new language. While googling “What are the best vacation destinations in India” I was pleasantly surprised to come across this website. Everyone here had provided valuable information that would be very useful in my search for the most suitable place for me. For a single woman like me, would it be safe to live solo in any part of India? have lived in USA for 27+ years now. I am 53 years old and want to retire. tired of rat race work politics and life here. can’t touch mu 401k and pension plan for 7 yrs to 12 yrs respectively. have savings to survive till then. want to relocate to uttarakand , kullu , have an OCI card , plan is to move to India in 2018 rent a place and see the feasibility of survival . the place that takes my fancy is DHAULATII. any body has any advice. Hello Readers, I am single 62 Indian born vegetarian living in USA over 30 years. After reading all comments I am still looking for information about OCI retired community in India. If any of you have knowledge, please share here or email me sonnymehta@yahoo.com. My desire is to live in India after retiring in coming years since I have NO tie in USA. Thank you for reading and effort to reply…..
Hi everyone,i am Scottish 66 and have visited India many times i also wish to retire there fed up with uk living i have made friends with good honest people and like everywhere else if you go with an open mind and heart you will be made welcome! ,problem is the visa rules and expense of having to keep returning! I am interested to speak with anyone who wishes to help benefit the poor and ideas are welcome especially ideas of creating jobs,of which i am interested in doing in Karnataka and sharing a large place (marigold hotel springs to mind ) to help with expenses of staying there! I am Indian born us citizen. Lived in Newyork for 16 years. As I don’t know anyone in USA planning to retire in India. Can anyone tell me about taxation of US and India and whom I am supposed to approach to discuss this matter? India fascinates me. Never been there though I have travelled many other places. I’m 57 this year and thinking of retirement plans. India is calling. I don’t plan to buy property or apply for citizenship. 6 months away from UK weather will suffice. Probably towards a large town certainly not one of the crowded cities. Can’t see the point. I’m used to travelling and setting up in new places so the challenge does not bother me. After all once retired I will have the freedom of time. I see myself in the north perhaps not distant from Himalayas with plenty of trekking opportunities. This message is for Ashok Gupta. Hello Ashok! I have always dreamed of living in Rishekesh because I heard so much about the abundance of activities one can participate in such as yoga, meditation, and volunteer opportunities. Now that I have already obtained a ten-year Indian visa, I am searching for a place to live. Where do I go to search for a condo, or apartment to rent for six months? I have ancestral lands in India, in the state of Assam, but thinking of retirement in Kerala with summers in Munnar Hills or Simla. I am currently a nurse but was a lawyer for several decades. I want to obtain my OCI (I am 1/2 East Indian and 1/2 European) and retire to India. My hope is to work with an NGO or other organization to help children who are victims o trafficking or otherwise lost parents and combine with a program to help stray animals as some programs have done in the U.S. Does anyone have a similar interest. Are there any physicians retiring that would be interested in a similar project? My question is about health insurance costs in India. Does India have a Universal Health Care plan that foreigners can buy into? If not, can sane and reasonably prices be found for private health insurance. I live in Thailand, where medical costs are quite low compared to the United States, and the quotes I got were much higher than it would cost to insure in the USA. This is nearly unbelievable, since the savings for insurance companies would be considerable. Any comments or information would be appreciated. My wife and I have been in the USA for over 50 years. I retired from a University about four years ago. I am now 86 yrs. old. Over the 50 yrs. we visited India several times and usually stayed with our relatives in Pune. I was in Pune in early 50s for 6 years for my college education. I came to the USA in 1962 and since then I have been in the USA. In 70s we made efforts to move back to India but they were not successful. In the USA I got excellent chances and was appointed head of a major department in health sciences and also served as the Dean of a health science school. In spite of my experience and accomplishments in the USA it was difficult to get any meaningful employment in India because of old outdated rules that govern employment. We still visit India for seeing our old relatives. Our experience has indicated that the life in India for old persons is extremely difficult. A total lack of cleanliness, rampant corruption at every level, lack of qualified help when one needs it, very undependable and costly domestic help, a nearly total lack of concern about old persons are some of the reasons we have decided to stay in the USA. I have studied problems faced by old retirees in the USA and in India. My conclusions are (1) India has only very few average quality retirement facilities that are very costly. (2) Access to good medical care is not available when one needs it, even in large cities. (3) Promises given in writing at the beginning are rarely kept by private agencies as well as the government agencies. (4) A total lack of civilian responsibility as far as cleanliness, garbage disposal, and public health is concerned. (5) Rampant disregard about traffic regulations. And most cities and towns have thousands of stray dogs that attack young children and old persons and a total inability of the civil authorities to take care of the stray dogs and treatment for rabies is not available in most areas. In our opinion it will be a tragic mistake to move to India for retirement andlmore so for American citizens. Access to yoga and other meditation techniques are also available in the USA and actually yoga teachers come to the USA for teaching and marketing their trade in the USA. So no need to go to Rishikesh or any other place in India. That is how we feel. I am 61 turning 62 in July of 2019. I have already planned to retire in India and the place I picked is Bordi Beach, Maharastra. It’s only 125 KMs from Mumbai and on border of Gujarat and Maharastra. It’s got the most beautiful beach and the cost of living is very reasonable. I did buy a farm house years ago and plan to move in next year. The quality of life is very good, the air is clean and money can buy you all kinds of life’s luxuries. Being a Gujju, I have lot’s of relatives living in Mumbai, Surat, Bharuch and Vadodara. I would have preferred a place in Gujarat but due to prohibition laws, I decided on this. Summer’s can be harsh, but with the arrival of monsoon in June, the area turns LUSH GREEN and I can sit on my porch and watch the sunset.